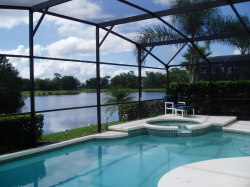 'Winter Haven' is situated on the prestigious Lake Berkley resort in Kissimmee just 10 minutes from Walt Disney World and 15 minutes drive from Universal Studios.This gated community has 24 hour security and offers a wealth of amenities in addition to those provided at the villa. 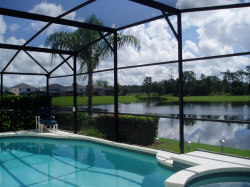 The pool and deck area has a most enviable view across the natural 14 acre lake. We feel privacy is of paramount importance and have created a natural living hedge down both sides of the screen netting without impeding the view in any way. 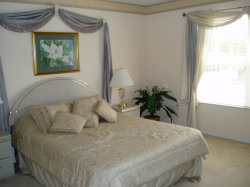 The covered Lanai has a ceiling fan for when that extra breath of air is required. The garage has been converted into a fully air conditioned games room with a full size, slate bed pool table, a PS2 console with games provided and a Tv on which to play them. Sleeping accommodation is provided by two master bedrooms each with en-suite facilities, two twin rooms both themed, and a ground floor bedroom equipped with a versatile day bed which can be converted into two twin or a queen bed as fits your needs.A wooden cot/crib and a pack and play are also provided. There are two eating areas, 'the nook' has seating for four and the dining table has seating for six. Two high chairs are also provided. 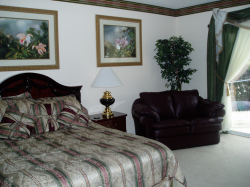 The family room overlooks the pool deck and the lake beyond and has soft leather sofas and marble coffee tables. The 42'' HDTV has digital cable channels and a DVD home theatre system. There is a wireless broadband internet connection for those guests wishing to bring their laptop/notebook computers.